The Book (by John Scalzi): A human diplomat creates an interstellar incident when he kills an alien diplomat in a most…unusual…way. To avoid war, Earth's government must find an equally unusual object: A type of sheep ("The Android's Dream"), used in the alien race's coronation ceremony. To find the sheep, the government turns to Harry Creek, ex-cop, war hero and hacker extraordinaire, who with the help of Brian Javna, a childhood friend turned artificial intelligence, scours the earth looking for the rare creature. And they find it, in the unknowing form of Robin Baker, pet store owner, whose genes contain traces of the sheep DNA. The book starts with the line: "Dirk Moeller didn’t know if he could fart his way into a major diplomatic incident. But he was ready to find out." Anyone who's not laughing has probably already clicked away. We'll continue. The book reads like a spy thriller, with delightfully wry prose pulling us through twists in politics and gunshots. Of course, there's also abundant science fiction -- both innovative tidbits and imaginative play with the genre's history. Along with fascinating alien cultures. What I loved about this book was the reversals. At one moment, the good guys were impossibly stuck, then a lawyer or an AI does something clever. The bad guys retaliate by turning their sucess into a trap, and so on. The novel reads like a gigantic, ever-changing puzzle. 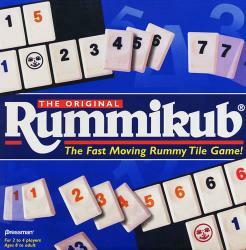 And "ever-changing puzzle" fits Rummikub perfectly. The rules are simple, but one tile can devastatingly change future moves. The sets are held in common and can be reorganized in any way, so long as all sets are legal when a player's turn ends. Usually playing a tile isn't as easy as adding it to the end of a run. Today, I only won a game because I saw a move rearranging some twenty pieces. I imagine most people reading this blog have played Rummikub, so I'll be short, but it's that brain-twisting puzzle-piecing that matches these two. In The Android's Dream, the final play is a delightfully ingenious one I didn't see coming. As a side note, the content in this book is a notch up from what I usually blog about -- a good fistful of swearing, plus some things that are mentioned in exposition, but not dramatized. I don't want to give spoilers, but if you'd like more detail, feel free to contact me. Thanks, Devin! I'm hoping I have more under the publication page soon, too.